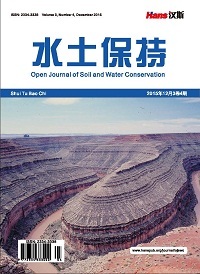 The simulated rainfall experiment was carried out in the area of the northern foot of Yin Mountain in Inner Mongolia; the accumulation effect of different modes of plastic mulching under different simulated rainfall of rainwater was studied. The results show that: the catchments effect of full plastic mulching is the best, and for the sandy loam, the moisture storage of full plastic mulching increases by 1.09% - 4% than control treatments; for clay loam, compared with treatment ,the moisture storage of full plastic mulching increases by 2.26% - 8.46%. When the rainfall intensity is 20 mm∙h−1 and rainfall in gully with plastic mulching reaches 20 mm, catchments effect is significantly lower. Because of the effect of evaporation-inhibiting and water conservation of FPRFM, the limited rainfall is concentrated in gully area, which plays a role in moisture storage and moisture conservation. 郑大玮, 妥德宝, 王砚田. 内蒙古阴山北麓旱农区综合治理与增产配套技术[M]. 呼和浩特: 内蒙古人民出版社, 2000. 李永平, 贾志宽, 刘世新, 等. 旱作农田微集水种植产流蓄墒扩渗特征研究[J]. 干旱地区农业研究, 2006, 24(2): 86-90. 寇江涛, 师尚礼, 王琦, 等. 垄沟集雨对紫花苜蓿草地土壤水分、容重和孔隙度的影响[J]. 中国生态农业学报, 2011, 19(6): 1336-1342. 肖继兵, 孙占祥, 蒋春光, 刘志, 郑家明, 冯良山. 辽西半干旱区垄膜沟种方式对春玉米水分利用和产量的影响[J]. 中国农业科学, 2014(10): 1917-1928. 任小龙, 贾志宽, 陈小莉, 等. 模拟降雨量条件下沟垄种植对土壤养分分布及夏玉米根系生长的影响[J]. 农业工程学报, 2007, 23(12): 94-99. 李彬, 史海滨, 程满金, 等. 集雨补灌玉米农田墒情预报的人工神经网络模型[C]//中国农业水土工程专业委员会第五次学术会议论文集. 北京: 中国农业出版社, 2008: 311-316. 贾志宽, 任小龙. 农田集雨保水关键技术研究[M]. 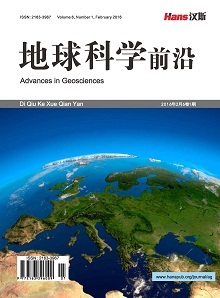 北京: 科学出版社, 2011. 王颖慧, 蒙美莲, 陈有君, 等. 覆膜方式对旱作马铃薯产量和土壤水分的影响[J]. 中国农学通报, 2013, 29(3): 147-152. 李巧珍, 李玉中, 郭家选, 等. 覆膜集雨与限量补灌对土壤水分及冬小麦产量的影响[J]. 农业工程学报, 2010, 26(2): 25-30. 潘业兴, 范志刚, 肖桂林. 沙壤土漏水田水稻高产栽培关键技术研究[J]. 湖北农业科学, 2010, 49(12): 2984-2985.